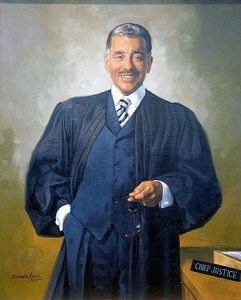 Home → Justices Biographies → Conrad Mallett, Jr.
Conrad L. Mallett, Jr. was born on October 12, 1953, in Detroit, Michigan. He received his B.A. from the University of California-Los Angeles in 1975. He also received his M.P.A. and J.D. from the University of Southern California in 1979. Mallett was admitted to the Michigan Bar in 1979, and immediately began his involvement in many legal organizations. He is a member of the National Association for the Advancement of Colored People, the National Association of Bond Lawyers, the Wolverine Bar Association, the State Bar of Michigan, the Detroit Bar Association, the American Bar Association, and the Genesee County Bar Association. His career in public service began when he served from 1983 until 1984 as the Director of Legislative Affairs for Governor James J. Blanchard. From 1985 until 1986, Mallett was the Director and Executive Assistant to Detroit Mayor Coleman Young.